Of our less remote “sister city” and the two mountain passes between. Returning from a brief trip to Montana, our southward route down Interstate 15 took us straight past that other Dubois across the border, in Idaho. I couldn’t resist paying a visit. This other Dubois is a few hundred yards from I-15. 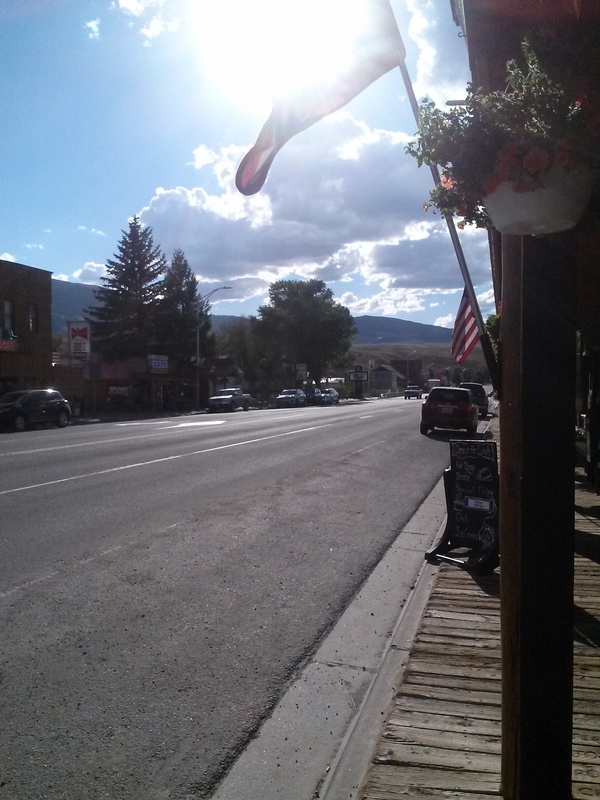 In Dubois, Wyoming, we live about 3 hours from the nearest Interstate–a fact that helps our town to qualify as one of the most remote in the lower 48. This town is less remote, but nonetheless smaller. Our own “Entering Dubois” sign reads “POP 971.” But the town feels larger than that because many people live outside the town limits, in the mountains. There are no nearby mountains here. Dubois, Idaho, sits in a broad valley of grass and sage. Some time ago I visited the third Dubois, in Pennsylvania, which is in the midst of mountains. It was named after a local lumber magnate, uses a capital “B” in the middle of its name (as he did), and had a population of nearly 8,000 at the last census. A sign at the freeway exit for Dubois, Idaho, promises a visitor center, which turns out to be the new rest stop. There are restrooms, of course, but no welcome desk with someone behind it to welcome you. Large glass display cases give information about the region–most prominently the history of the Idaho National Laboratory at nearby Arco (population 995). It’s the site of “the world’s first and the United States’ only fatal reactor accident,” according to Wikipedia, in which 3 people died when an accidental steam explosion destroyed a nuclear reactor. I’ve been curious about Dubois, Idaho, because understandably some people confuse our Dubois with this Dubois on the other side of Jackson Hole. A tourist once told me that a shop clerk in Jackson told her to stock up on groceries and gas before heading over the Pass to Dubois because there’s nothing there. I had to laugh, thinking of our large grocery store and four gas stations. In this Dubois, the one gas station is boarded up and there’s no supermarket. There are two motels and two restaurants, one of which got a five-star review on TripAdvisor only last week. I wish I had noticed it myself. Founded in 1892 and originally named “Dry Creek,” the Dubois in Idaho is 22 years older than the one in Wyoming. This Dubois re-named itself around 5 years later, in honor of the same Idaho senator and Postal Service official who bestowed his own name on our Dubois, rather than allowing residents of a small Wyoming town to use the name they had chosen. Dubois’ main street ends after a few blocks at this ranch and, beyond it, the train tracks. Trains first came through this area in 1879. I’ve read that there was talk of running a train line through Dubois, Wyoming, long ago, but it never happened. Without an Interstate and a train we are truly isolated, in one sense. But far more traffic passes through our Dubois, being on one of the two main routes from Denver to Yellowstone. It didn’t seem that many other cars had ventured past the rest stop to explore this Dubois as we did. I asked them about the economic basis of the Idaho town. Agriculture, they replied. Mostly hay and, of course, potatoes. The Episcopal church was built of clapboard, not of logs like our own. It has become the town museum. I noticed in passing that Dubois has its own visitor center housed in the small town library, but that was closed as we came through on a Wednesday afternoon. To reach home before nightfall we had to hurry through Idaho Falls and on toward Jackson Hole. We passed through Victor, Idaho, a booming bedroom community for Jackson, at about 4:45. From that point on, we saw a continuous stream of cars heading in the other direction. These are the commuters who cross the steep and narrow highway over Teton Pass every day. Speed limits are slow, between 25 and 35 mph. “There are no passing lanes,” someone wrote on a TripAdvisor forum, “so if you get caught behind a slow vehicle, you are pretty much stuck.” RVs and cars with trailers are advised to avoid this route. My husband shifted to a lower gear as we headed downhill toward Jackson. There are runaway truck ramps every few miles on the 10% grade (one of them, alarmingly, on the opposite side of the road), and trucks are warned to stay in low gear almost all the way to the base on the eastern side. The endless single line of commuters extended almost all the way back into Jackson. Once beyond Jackson and the construction at the new roundabout south of the airport, we were slowed only by a few out-of-state cars dawdling to look for bison or enjoy the view. Heading toward our own Dubois and home, we took a new kind of pleasure in the drive over Togwotee Pass, which we always enjoy. This time we noticed the wide shoulders on the highway over this beautiful Pass, the gentle slopes, the broad curves, the 55 mph speed limit, and especially the frequent passing lanes. Not to mention the splendid views. Defying the experts in a search for remains. I used to love scrutinizing the rocks as I hiked. I hoped to find something important. I’d find pretty green and pink rocks, rocks with interesting shapes, rocks that might have been carving tools, once a petrified twig. I’ve mostly stopped doing that, because I really don’t know what I’m looking for, or at. But some others do, and they have found it—in abundance. Paleontologists “spend a lot of time walking around with their eyes glued to the ground, because that’s where the fossils are,” said Calvin So, a paleontology student at the University of Wisconsin. I heard him a few weeks ago at the Riverton Museum. Two days earlier, the crew of the Nobby Knob Triassic Expedition had covered over their site southeast of Dubois to leave it behind for the winter. They have spent this past summer excavating a trove of remains from what So called “the dawn of the dinosaurs,” between 230 and 200 million years ago, during the Late Triassic. Team leader Dr. Dave Lovelace gave a similar presentation at the Dubois Museum in July, when I was out of town. My husband went, and phoned me afterwards with astonishing news: Lovelace and the team have been tramping around the outskirts of town for the past four years, searching and digging for fossils. They’ve been defying the experts, looking for remains in a geologic stratum in Wyoming that paleontologists have referred to as “the big red dead,” always thought to be a dry and barren period devoid of animal remains. The fact that the team has proved them wrong should not surprise us in Dubois, where we know that dry and apparently barren does not imply a lack of life. “We have found an abundance of fossils,” So said, “contrary to what other people have been saying.” Almost everywhere they’ve looked in the Wind River Valley, Lovelace told me, they have found fragments of bone from this period. After finding a tantalizing whole phytosaur skull near Lander, where a few Triassic finds were reported in the early 1900s, the team began to explore the red dirt on public land almost within view of structures in Dubois. In 2014, they found fossil fragments of extinct salamander-like creatures known as temnospondyls. The next year they determined where those fragments had been eroding from. This summer, the crew was digging at that spot for two months. Who knew that these guys (and women) have been out there, as they put it, “digging up Dubois” for four years? (“Anyone who is interested can see us from the main drag in Dubois,” Lovelace said.) And who would have guessed what they’d uncover? When Wally died, sometime way back in a period when the continents were in entirely different shapes and orientations, this area was covered with a shallow lake. Think, So said, of a creature lurking partly submerged, waiting for something to ambush. Extracting the fossils can be brutal work. To extract the fossils from the dirt, they cover them with plaster. One plaster “jacket” containing dozens of stone-covered fossils weighed 500 pounds, So said. It took about 400 hours of work to chip away painstakingly at the surrounding rock in order to expose the fossilized bones. Another weighed about 1000 pounds. Once the specimens arrive in Wisconsin, the team exposes the bones. Then they run them through a CT scanner and analyze them using a custom imaging program that allows them to discern the individual bones inside a skull. In 2016, the team began excavating another site nearby that is rich with remains. Lovelace calls the Serendipity Site a “mass death assemblage.” It’s a Late Triassic cemetery of sorts; a large collection of burrows containing the fossils of tiny early amphibians, probably distant ancestors of the salamanders. Many of their skeletons are preserved largely intact. This could be echoes of a distant climate change. So said these may be the remains of creatures that went into estivation – a sort of hibernation intended to wait out a drought – and were doomed when the drought lasted too long. This site adds to another prehistoric distinction for Dubois: A curator of the American Museum of Natural History in New York has called this region “the epicenter of Rocky Mountain archaeology,” because the prehistoric high-altitude villages found above Whiskey Basin a decade ago have changed our ideas about some of the earliest Native Americans. Now this site is changing the way we think about some of the earliest vertebrates. There are enough late Triassic fossils just east of town to classify Dubois as a “world-class vertebrate paleontology locality,” Lovelace told me. The other sites (in Poland, Portugal, Morocco, and New Mexico) are “multi-taxon sites” that include remains of several different types of animals. Most of them are random collections of bones and skulls, not large numbers of complete skeletons. The Dubois site is unique, according to Lovelace, because it preserves a single type of animal. This leaves a number of unanswered questions: Were they small because they were all young? (It is not uncommon for adults to inhabit different areas than their young to avoid “their young becoming part of their diet,” he says.) Or are they a new and different species? And another intriguing question remains: Why were more than half of the burrows at Serendipity not found empty, but still encasing the skeletons of tiny creatures doomed never again to walk that alien, ancient landscape? What was the fatal factor? The crew will return next year to continue work at the site. © Lois Wingerson, 2018. Thanks to Dr. Lovelace for reviewing the text for accuracy. Nostalgia for things never experienced? Cowboys roping in baseball caps, and empty spaces on McNally Maps. Dry creeks and history on the page. Sycamores and prickly pear. Barrel racers with great big hair. Horses swishing flies out in the sun. Those aren’t my words. They’re Dave Stamey’s words. It seems like the whole town has come out to hear the cowboy songwriter, and not just because it’s the best thing going on right now. Nearly every seat in the big room at the Headwaters Center is taken. He has us in the palm of his hand. I get just a bit choked up at that, and I’ve only been here for 10 years, for crying out loud. The words and the music reach down somewhere to grab at me the way a good song can. Somehow I feel a longing for something that I haven’t yet lost. In fact, I’ve barely begun to experience it. Stamey takes a pause to take several jabs at a popular old song, “Riding Down the Canyon” by Smiley Burnett, which has featured in Western films and in recordings by many famous country singers. He recites a few of those lyrics. There’s a knowing chuckle from the audience, and I join in — not that I’ve ever done a single chore at a ranch. My only experience at ranches was as a dude, where I relaxed while others did the chores. To folks at their radios or in movie theater seats, the song evoked a longing for a laid-back, heavenly way of life that didn’t actually exist. Well, I do know a thing or two about that. My Dad was once a guy at a piano in New York. There he met my mother, a lovely young classical singer trying to make her way in the big city, having grown up on a farm in Nebraska. She would have enjoyed Dave Stamey. When they met, Dad was making his living by working for a Broadway composer (who probably was a little bald man with a piano). As time went on, Dad wrote many fine songs of his own, although they weren’t cowboy songs. He had sense enough not to write about what he didn’t know. They include this one, ironically called “City Longing,” which is actually about longing to leave the city. The frenzied, self-promoting feel of New York disenchanted my soon-to-be parents, and they left to teach at colleges in the Midwest. I’ve always found it ironic that New York is where I ended up spending most of my life. Being the only child of two classical musicians, of course I grew up loving that kind of music. I learned several instruments. I used to play in string quartets and orchestras. That is one of the very few things I miss about New York. In a small way, I do long for it. Watching an orchestra performance now is a sort of bittersweet torture. Nonetheless I crave it. So I impose it on myself, when I can. A few days ago, I took a lovely ride over Togwotee Pass to Teton Village near Jackson, to watch the dress rehearsal of Mahler’s 3rd Symphony at the Grand Teton Music Festival. Musicians crowded the stage: 9 string basses, 10 violas. Two sets of tympani. Lost in nostalgia, while I listened I watched them at work and relived it all: the feel of the tremolo on the string, the sound of counting bars inside my head, the sense of eyes flicking up to the conductor over the top of my glasses. This kind of nostalgia I can explain. Other feelings puzzle me. When Mahler wrote his third symphony, he was living in his mountain retreat in Austria. He used to go there in the summer to escape the pressures of his daily work life. We lived in Germany for a few years, so I speak both his language and his language of music. And now I live in the mountains, having retreated here from the pressures of our daily working life in the city. In Mahler’s music, I felt I could hear him speaking from the grave. He wrote pictures in sound: deep, rich, and complex–sometimes ominous and foreboding, at other times whimsical or light-hearted, with the strains of forest birds and distant trumpets. Sometimes he launched into the bouncing chords of a Tyrolean oompah band. In my work as a science writer, I learned that neuroscientists have found that music touches the same nerves in your brain (I’d rather say “strings in your heart”) that trigger deep emotion. It’s one of those things that scientists find out which you sort of knew all along. A few days earlier, alone on the stage strumming on one guitar, Dave Stamey had evoked the feel of the entire American West with a few simple words and quiet melodies. And he had demonstrated how music can also evoke a longing for experiences that people haven’t even experienced. No doubt a musicologist could parse way these two different musical languages differ in their grammar. But that wouldn’t explain how they can speak so distinctly inside my one little brain, somehow triggering those little hairs inside my ears to play on my neurons in ways that can summon up two entire worlds, separated by years of time and thousands of miles. I might start pondering that again next time I look up at the stars or out over the valley. But of course I won’t ever figure it out.